Ogechi, an Atlanta-via-Kansas City rapper and poet, celebrated her blackness at a free Uptown Arts Bar performance on Wednesday night. The event also acted as a release show for her new EP "Intersectional Blvckness" and a brief showcase of other Kansas City talents. The young poet performed her new EP in full, as well as a cover of Rihanna's murder ballad "Man Down" while dressed in traditional Nigerian garb plucked from her mother's closet. 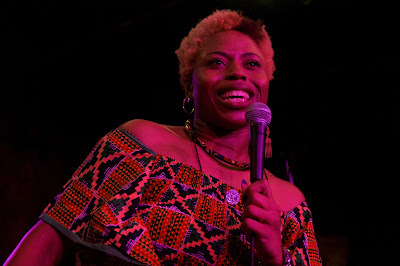 Ogechi's poetry reading experience came across in her powerful delivery; she drew unrestrained rounds of cheers, screams, and clap-alongs several times in her set while teaching and preaching to a room of her peers. Rapper/singer Khrystal was accompanied by Duncan Burnett in a strong showing that needed no backing tracks. Tales of "Quarter Century Living" bloomed from the PA as Burnett punched away at a drum pad and Khrystal charmed the audience with her black girl magic. No Alternatives rapper Solomon began his set with a strange proclamation: "Solomon invented the lawnmower." Having thoroughly confused a room full of people, Solomon jumped into a quick set of fun, bubbly hip-hop that yanked fans out of their seats and got them dancing. Kansas City emcee Repp Jones also had a short slot which he filled with rhymes about heartache and a guest spot from the evening's headliner. Singer-songwriter Kent Crockett let the fans choose: original song or cover? The result was an impassioned take on Khalid's "Location."